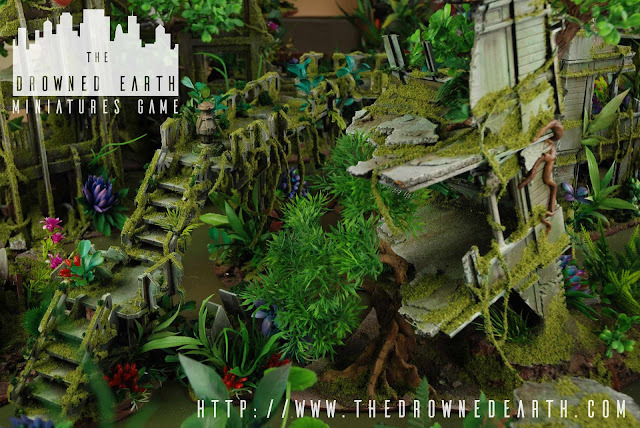 Wargame News and Terrain: The Drowned Earth: Surviving in the Ruins of The Past - The Drowned Earth Game Kickstarter Inbound! The Drowned Earth: Surviving in the Ruins of The Past - The Drowned Earth Game Kickstarter Inbound! 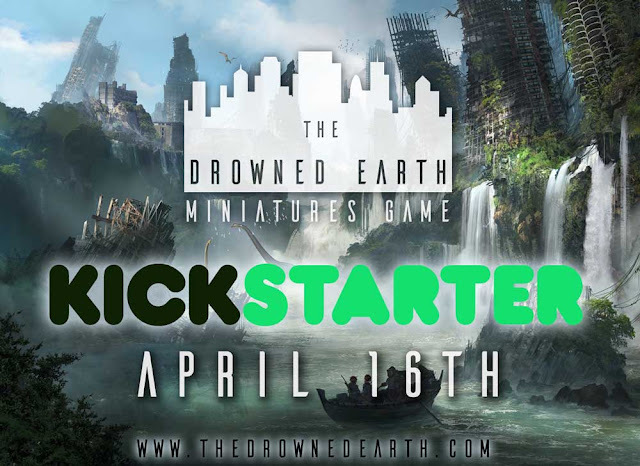 Just received news from James Baldwin over at The Drowned Earth that the Kickstarter to fund the The Drowned Earth science fiction skirmish game and miniatures will launch on the 16th of April. 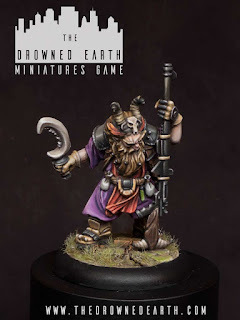 Find Paul's introduction to the game and setting below along with some great scenery and miniature pictures. 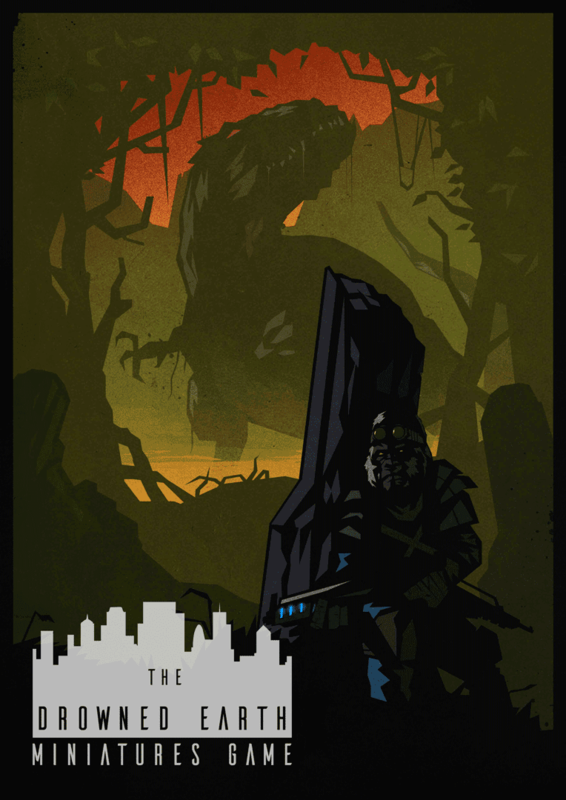 The Drowned Earth: First look at the Game. If you've heard about The Drowned Earth Kickstarter lately then you're certainly not alone! In this article we're going to take a brief look at what sort of game it is, and discuss some general points. The first and most obvious point is that this is a low model count, character based miniatures game. Billed for games of 5-15 models (and working equally well with anything within this range) the game is played on a 3x3 board. Like a lot of science fiction skirmish games, cover is important, or your models will shoot each other to pieces in no time! The game has been advertised with loads of beautiful, jungle ruin themed terrain, but the creators say it works perfectly well with less terrain, provided there's lots of cover to hide behind! In a game with a name like this, water is also a big feature, but again, not essential. It's fun to leap off tall buildings, guns blazing, and then landing safely in water. Swimming slows you down, as you might expect, and provides some cover too. But not all areas of The Drowned Earth are under water, and theres no reason not to fight on dry land. So while the game might look like the terrain is a bit of a barrier to entry, I think most people who play games at home will have enough terrain to get by. This is especially true considering the board size is under average. Lets have a brief look at the activation structure. The game is alternate activation, meaning that you each take turns in activating a single model. Each model has a personal pool of Action Points which they may spend during their activation. However, models can also use these action points out of turn, to react against their opponent's actions, provided they have line of sight to the action. This, combined with the alternate activation gives the game a really involved, immediate feel: you're constantly interacting with your opponent, facing off in "firefights" and "duels". What's more, the orders are somewhat fluid when it comes to moving and shooting: you can shoot in the middle of a move, which creates a very cinematic feel, and often creates those wonderful moments of epic story, where an important objective is contested in a split second of furious action! 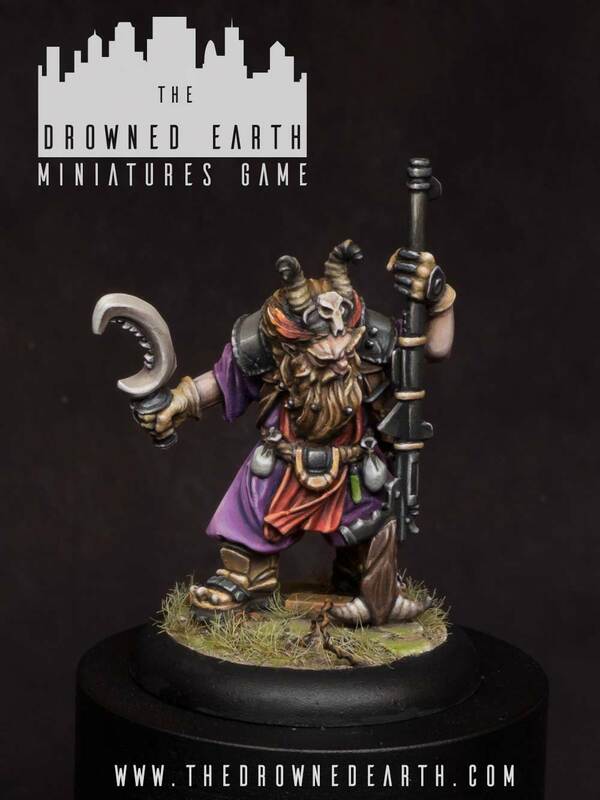 So this is probably the "Unique Selling Point" of The Drowned Earth wargame. Movement is pretty different to most other games: it's very easy to climb, leap, jump off things, swim and otherwise be awesome. Remembering that you can shoot in the middle of these forms of movement, this is a game where some pretty epic things can happen! Honestly, when reading the movement chapter of the Beta rules (the rules are still subject to some change, although the creators have indicated the core rules will only need a few tweaks here and there), it can seem a little complicated, but actually its very simple: You declare your chosen movement path, and if it includes "dynamic movement" (leaping, climbing, jumping down) you make a test. Each model has two movement values: if you get one success you move the short distance, and if you get two successes (called "Nailing It" in the game) you move your full distance. It doesn't matter how many different types of movement you encounter, you just test once, and measure. Of course you can fail as well, and what happens when you fail depends on the type of movement you are encountering. Typically you just move as far as you can, and stop at the terrain which made you take the test. Rarely, you can critically fail, when something really bad happens (like falling off the edge of the building), but these really don't happen all that often. There are a few other rules which really give the game character, which don't fall under the above headings. All models have special rules, which is where the tactics of the game really come in. Most characters also have a "class role" such as Mechanic, Medic or Leader. These are accompanied by special rules such as infiltration, repair, heal or, in the case of the leader, Command. Command allows a leader to take a free Command test (it doesn't cost an action point to do this) to move Action Points between friendly models (including himself) provided he has Line of Sight to them. This can be extremely useful when building a turn strategy, especially as the leader can do this multiple times until he fails a Command test. We should also talk about the "Feat" mechanic: when taking a test there's a special symbol which overrides any other results rolled on other dice: it's an automatic success AND grants the model another Action Point. This can suddenly give a model the boost he needed to achieve something significant, or even just to duck down out of danger. There are also the usual flame templates, stealth mechanics and other little bits of fun... including... Dino models?! Well yes, indeed, apparently in The Drowned Earth, provided you rear them from egg, it's entirely possible to train and even ride dinosaurs. This isn't currently represented in the Beta rules (except for the odd tantalising reference to "troop" and "beast" models, and these will have to wait till the faction starter boxes and rulebook are unlocked. After then? Who knows! I hope you've enjoyed this brief look at the game. 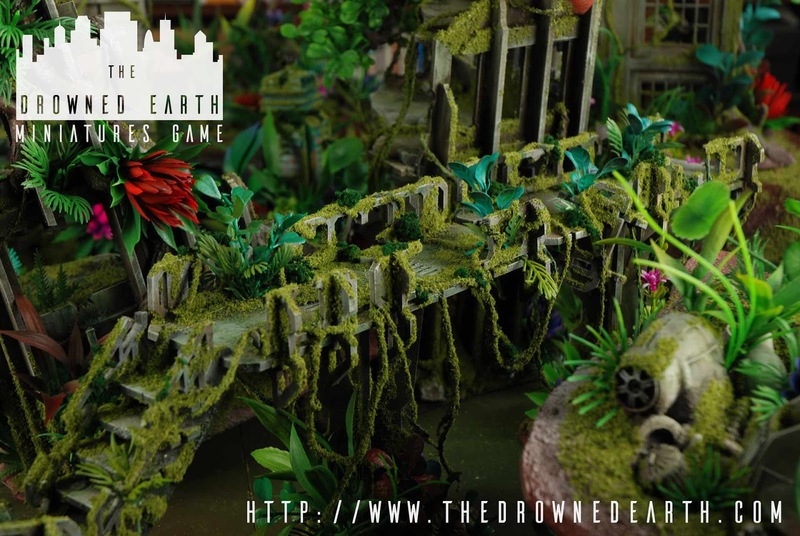 To find out more head on over to check out The Drowned Earth Kickstarter!